In this issue, we look in-depth at the phenomenon of diaspora philanthropy. With increasing numbers on the move, new ties are being formed between peoples, nations and states across the world. While most attention has focused on remittances – the act of sending money from one place to another – we shine a light on the philanthropic dimensions of diasporas worldwide. 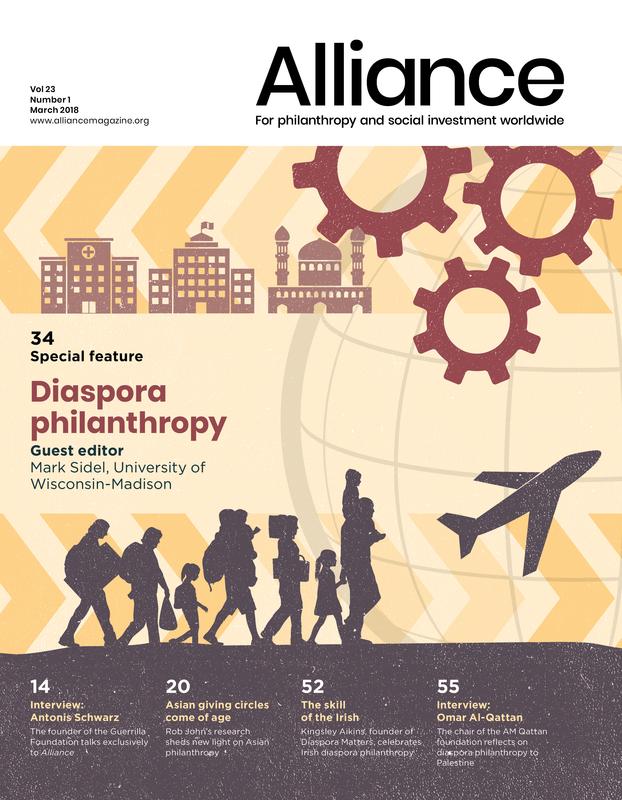 The perspectives of contributors from Africa, India, Pakistan, Kashmir, Ireland and Palestine, to name a few of the places you can read about in this issue, reflect the truly global nature of diaspora giving. While both the terms ‘diaspora’ and ‘philanthropy’ may evoke a generally positive reaction, diaspora philanthropy can raise thorny questions. For example, our guest editor Mark Sidel and Indian contributor Rajesh Tandon call attention to the ways in which diaspora philanthropy can be used as a tool of nationalist forces. This makes the need for good data, careful attention and greater scrutiny all the more important – something we aim to offer in this issue. This is especially so when it comes to diaspora giving in the context of the Israeli-Palestinian conflict. Our sub-section on diaspora philanthropy to Israel and Palestine features an exclusive interview with Palestinian diaspora philanthropist Omar Al-Qattan as well as profiles of Jewish philanthropists lending a hand to Israel. This issue also looks at the philanthropy of a younger generation. What do you do if you inherit a fortune but want to change the system which helped to create it in the first place? I speak to 29-year-old Antonis Schwarz, in one of his first major interviews. Finally, thank you for your positive feedback on the new-look Alliance. Despite limited resources, we strive to improve what we offer you – our readers – and the global philanthropic sector, so please keep your comments coming, however critical. Charles Keidan is editor, Alliance.